Connecticut’s retirement healthcare fund for state employees is short $36 billion, which amounts to more than $10,000 per person in the state, according to a new study by the American Legislative Exchange Council. Connecticut’s other post-employment benefits [OPEB] trust fund is only 1 percent funded, according to the study, which is an improvement since 2016. Connecticut was one of only five states with per capita OPEB debt over $10,000. The national average was $2,762. Connecticut’s retiree healthcare system was not funded at all until 2009 when employees started to pay 3 percent of their paycheck toward retiree healthcare. State employees make that 3 percent payment for ten years as part of the 2009 SEBAC agreement and Connecticut started matching employee contributions in 2017. Before then, the state did not require employees to pay into that system and did not save money to fund retiree health benefits, choosing instead to operate on a pay-as-you-go basis. 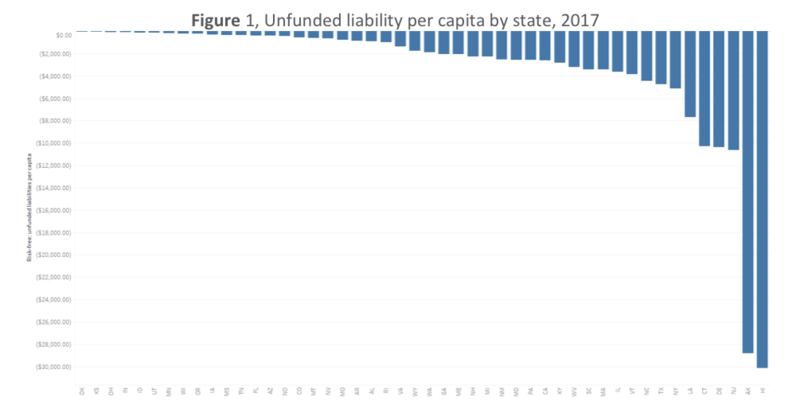 Despite the contributions from both employees and the state, Connecticut remains woefully behind in funding its retirement benefits. According to the study, Connecticut continues to underfund its OPEB obligations and only pays 36 percent of the annually required contribution. A previous report by J.P. Morgan showed Connecticut had the highest OPEB liability per state worker in the country at more than $200,000. The state has also failed to meet its assumed rate of return for the OPEB trust fund, according to the ALEC study. Although Connecticut used an average discount rate of 5.7 percent in 2017, the state’s investments only returned .23 percent. Connecticut’s discount rate was above average for states using a pay-as-you-go method for funding OPEB costs. Along with pensions and debt service, Connecticut’s retiree health benefits are one of the fast-growing fixed costs contributing to the state’s perpetual debt crisis. In 2017, the cost of retiree healthcare surpassed the cost of healthcare for current employees. Those costs were expected to grow $120 million by 2019, but a recent switch to Medicare Advantage may save the state just as much in administrative costs. Part of the 2017 SEBAC concessions agreement allowed the state to switch to Medicare Advantage in order to save up to $130 million per year because the state would no longer act as the insurer. Connecticut is known for having a very generous retiree healthcare plan. Former Connecticut Attorney General and current U.S. Senator Richard Blumenthal, declined federal health benefits in favor of Connecticut’s retiree plan, along with four other congressmen. According to the study, the national OPEB debt grew $54 billion between 2016 and 2017 to a total of $864 billion. The strain those liabilities are putting on state governments has led to some notable changes in benefits offered by some states. Nebraska, South Dakota and Kansas shifted to defined contribution health plans that allow a retired employee to buy into the state plan. Kansas reduced their OPEB liabilities from $479 million to $13 million and will eventually eliminate their liability altogether. Hawaii had the highest debt per capita at $30,000, followed by Alaska with $28,000. The liabilities for each state were calculated using a risk-free return rate.